Our clinic boasts 16 fully-equipped optometric consulting rooms including specialist facilities in contact lenses, low vision and visual stress. 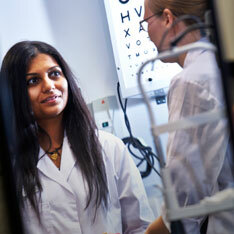 We also work together with local schools and societies to help promote good ocular health in our community. Our students are fully supervised by qualified optometrists who are a mixture of full-time lecturers and visiting clinicians from local practices. We’ll carry out a thorough examination of your eyes, which will include assessing your vision, ocular health, muscle balance, intraocular pressure and visual field analysis. We can fit almost all types of contact lenses including soft daily, two weekly, monthly and yearly replacement lenses. We can supply both standard material lenses as well as the more breathable silicon hydrogel lenses, for most of which we are able to give free trials. We also fit standard gas permeable and hybrid lenses. Certain types of lenses are available in both single vision and multifocal prescriptions. If you want to change or enhance the colour of your eyes, we can fit you with coloured lenses. We stock over 350 frames ranging in price from £20 to £130, including standard single vision to varifocals, thinner and lighter lenses and photochromatic lenses that adapt to lighting conditions. We offer a detailed colour vision assessment for referred patients and for interested private individuals. A full-colour vision assessment is carefully carried out under controlled lighting by experienced vision scientists and/or optometrists giving you a more complete understanding of your colour perception difficulties. Appointments can be made Monday–Friday by visiting the clinic or by telephoning 01223 698070 or 0845 196 2070. Private and NHS patients are equally welcome.